About holographic master Shoot holographic master. More than 100 patterns big size holographic originations in stock, as well as supplying customized design master origination up size to 1200mm*650mm. Photoresist glass with laser beam effective pre-coated chemical can record hologram image by laser beam in lab or matrix system. Hologram master origination is a piece of nickel shim copy from photoresist glass made by process of electronic forming. It's mother shim for next step hologram printing. 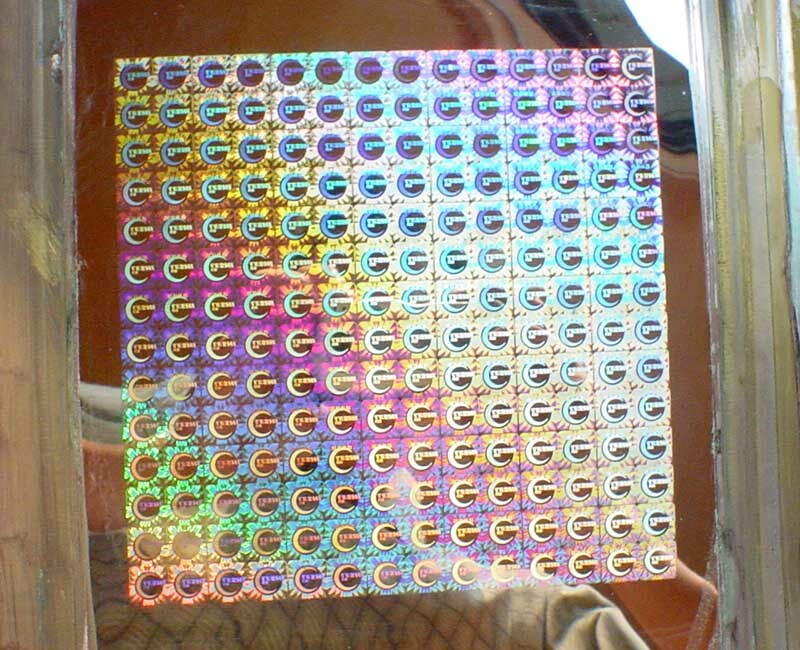 Hologram shim in size of 6'*6' embosses on metalized film for sticker. Big size hologram nickel shim widely to do soft emboss for holographic packaging. We supply whole set hologram production line, training and technology transfer with chemical formula for differnt solutions of hologram printing. 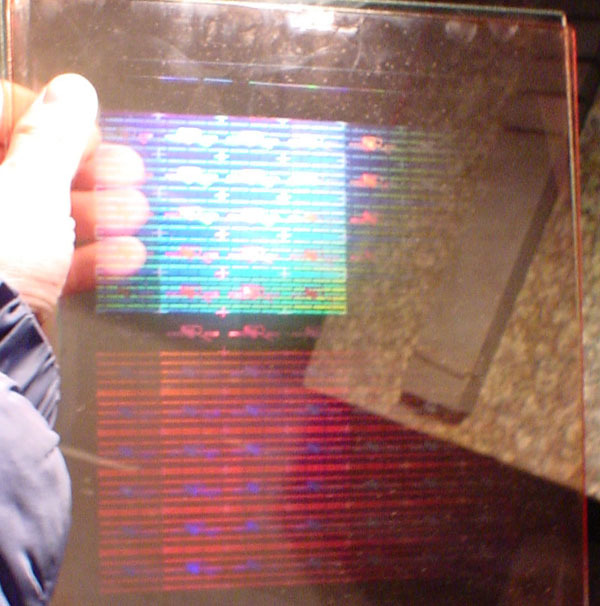 Step one, to make record holography image onto photosensitive glass master and deliver it. Photosensitive Glass Master. The photosensitive glass master has holography image come our after delivering. Photosensitive Glass Master of 'Original' general design. It's 2D/3D two layers. One color foreground and two color background. Photosensitive Glass Master. It's 2D/3D three layers. One color foreground , one color background and one color floating. Step two, to coat silver layer onto photosensitive glass master, then the glass get current conducting. So we can put this glass into electronic forming tank to electronic form. This is silver layer coated photosensitive glass master photo of above glass master. After silvering, glass get conducting, so we can put it into electronic forming tank to make master origination. 2D/3D master origination. It have 3 color in foreground, 2 color in background deep and one color floating. Click here to see master operation shim. 2D/3D master orgination. It has three layers. One layer rainbow effect on foreground(surface), one layer floating and one layer in background deep. Click here to see master operation shim. 2D/3D master origination with E-beam hidden text. It has one layer floating, one layer on foreground(surface) and two layers in background in two color. dot-matrix effect & 2D/3D combination holography master origination. The text on surface is 2D/3D which make the text shining and clear.Movement effect is come from Dot-matrix effect. dot-matrix effect & 2D/3D combination holography master origination. The text on surface is 2D/3D which make the text shining and clear.Movement effect is come from Dot-matrix effect. There's white register mark for automatic die-cutting and serial number printing track at the bottom of photo. Click here to see master operation shim. dot-matrix effect holography master origination. All text and image is made with Dot-matrix way and the movement effect also is made in dot-matrix effect. Click here to see master operation shim. Step four, to duplicate holography operation shim for embossing. The holography operation nickel shim is one mirro copy of master origination master. 2D/3D master operation shim(image is positive). This shim is one copy of master oigination(image is nagative). This is photo of holography operation shim which has been embossed by hard embosser. Click here to see master origination. To see arkwork. 2D/3D master operation shim(image is positive). Click here see to master origination. To see arkwork. 2D/3D master operation shim(image is positive). It has three layers hologram image. This is photo of holography operation shim which has been embossed by hard embosser. To see arkwork. 2D/3D master operation shim(image is positive). It has three layers hologram images. This is photo of holography operation shim which has been embossed by hard embosser. To see arkwork. dot-matrix effect & 2D/3D combination master operation shim(image is positive). This is photo of holography operation shim which has been embossed by hard embosser. Click here to see master origination. To see arkwork. dot-matrix effect master operation shim(image is positive). This is photo of holography operation shim which has been embossed by hard embosser. Click here to see master origination. To see arkwork. A laser is used to illuminate the physical object, with the reflected light falling on the photoresist plate. Simultaneously, a reference beam from the laser also falls directly on the photoresist plate. The interference patterns of these two light beams react with the photo-sensitive coating to record a holographic image of the object. Common exposure times are between one to 60 seconds. In photography, slight motion of the object or the film results in a blurred image. In holography, however, the exposed plate will be blank (contain no image at all) if during the exposure there is movement as small as one fourth the wavelength of the laser light (wavelengths of visible light range from 400 to 700 billionths of a meter). A typical photoresist plate has a 6 in (15.24 cm) square working area; an extra half-inch (1.25 cm) of space on two edges allows the plate to be clamped into position. Because many holograms are smaller than this, several different images can be "ganged" (clustered) onto one plate, just as numerous individual photographs are exposed on one roll of film. The plate on which the original hologram is recorded is called the master. After being exposed, the master is processed in a chemical bath using standard photographic developers. Before proceeding with production, the master is inspected to confirm that the image has been properly recorded. Because of the chemical reactions caused by the laser and the developer on the photoresist, the developed plate's surface resembles the surface of a phonograph record; there are about 15,000 grooves per inch (600 per cm), reaching a depth of about 0.3 microns (1 micron is a thousandth of a millimeter).